Take your home’s comfort to the next level with help from the flooring experts at Buddy's Flooring America. Many of our customers love the look, feel, and low maintenance of luxury vinyl floors for their kitchens and bathrooms, but prefer soft carpet for the other rooms of their living or work space. Our professionals are highly knowledgeable about carpet flooring in Miamisburg, OH, and can help you choose a style that is perfect for your space. When you visit our flooring showroom, you’ll always be greeted by friendly staff that is ready to help you choose the perfect carpet for your family home. We have decades of experience when it comes to helping our guests find beautiful flooring solutions at the best prices in the market. Now we’re ready to put our expertise to work for you. Different flooring styles have their own unique aesthetic and practical values, and carpet is no exception. We offer affordable carpeting in hundreds of different colors, cuts, and patterns to help you find exactly what you’re looking for. In addition to its appearance, carpet also provides insulation that helps keep your environment warmer, virtually eliminating the need for house slippers or socks. One of the major benefits of carpet is that it reduces the likelihood of slips and falls. This is especially helpful in homes or businesses where there are young children or seniors. Carpet flooring, especially in high traffic areas, play rooms, and on stairs is a great way to protect your loved ones or decrease the risk of workplace injuries. 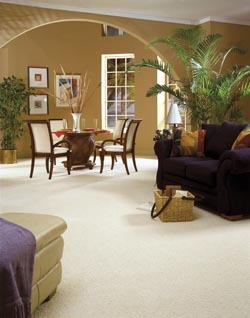 If you need help choosing the safest styles, visit our carpet showroom and ask one of our professionals for guidance. We’re more than happy to provide guidance. Count on our flooring showroom for carpet solutions that fit into your price range. We proudly provide our carpeting at the most competitive prices in the market, allowing you to get huge savings on your project. In addition to our many flooring options, we can connect you with carpet installation services. Once you’ve chosen the perfect flooring, just let us know, and we’ll reach out to our partner contractors. Contact us today or visit our showroom to find out more about our carpet flooring selection. We proudly serve residents of West Carrollton, Germantown, and Miamisburg, Ohio, as well as those in Franklin, Springboro, Centerville, and Oakwood.